I was born to be an engineer,” says Sipho Myanga of Nelspruit in Mpumalanga. A school visit to the OR Tambo International Airport as a young boy was all it took for Myanga to develop an interest in understanding how mechanical things worked. “I was fascinated and impressed by the airplanes. It was just so amazing,” he said. After his visit to the airport, Myanga started building small airplanes using waste materials like old cardboard boxes. He couldn’t get them to fly, but he decided that one day he would invent and build his own machines. During a visit to an amusement park, he was fascinated by the roller coaster. He decided to build one using motors from old electrical items. He was very happy when it moved as this was the first time he managed to make something work. At this stage Myanga was only 15 years old. At school, Myanga struggled with science subjects and he had to repeat standard seven as a result. He needed these subjects if he wanted to become an engineer. Hard work and the need to fully understand how things worked in a scientific way helped him to pass. Apart from focusing on his school work, Myanga also visited science fairs. He watched how other people designed things, which helped him with ideas to invent and build his own machines. He built two mini power stations, which worked. They only produced enough power to light an electric light bulb, but it helped him to understand how electricity was made. Myanga has since come up with a number of ideas on how to solve the country’s electricity problems. But, like all inventors, he wants to test these first before he makes them known. 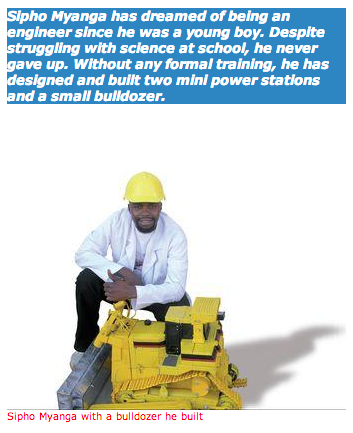 He has also designed and built a bulldozer, which works with a remote control. The machine, which he calls Sigamitha, can be used as a garden tool to move and plough the soil. After matric, Myanga didn’t have money for further studies and found a job at a call centre. But thanks to his employer, he is now well on his way to becoming an engineer. His employer found out about his talent for science through a newspaper article about him and offered to pay his university fees. 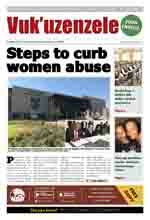 He now studies mechanical engineering at the University of the Witwatersrand.